The first part of the Scotichronicon, a chronicle of the Scots, was written c.1385 by John of Fordun, an Aberdeen priest, who was probably originally from Fordoun, halfway between Dundee and Aberdeen. Walter Bower or Bowmaker, abbot of Inchcolm in the Firth of Forth, continued Fordun's unfinished work c.1445. This copy of the text is known as the Black Book of Paisley because it was written at Paisley, to the west of Glasgow. 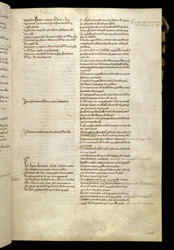 The main texts are preceded by an alphabetical index, ending in the first column of this page, with words beginning with X, Y, and Z. At the bottom of the column is an eight-line verse colophon giving its name (scoticronicon, line 2) and author (fordon, line 5), to which has been added in the left margin the name 'Bower'. The right column contains the start of a list of Scottish monasteries, starting with Iona, founded by St. Columba.